The high winds from Storm Gareth have brought down trees near the boundary of Davies Field on the Golden Hill site. This image shows a tree that has fallen and threatens to crush a hut on the Horfield Organic Community Orchard located at the top end of Davies Field at Golden Hill. There a number of ailing elm trees that are liable to fall and this recent storm has brought one down. Although the trees are close to the allotment boundary, they are not actually the responsibility of the Allotment Association as they appear to be on Council land. 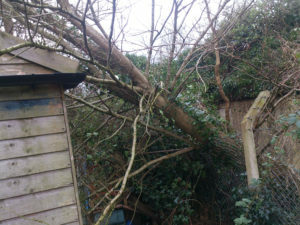 The Association is consulting with our tree surgeon about how to proceed on this and other trees. First year on the allotment? The Horfield and District Allotment Association site in Bishopston. Bristol, BS7 8NE is just through the gates at the end of Monk Rd, behind Bishop Road School and Horfield Prison.